TCAS offer a range of Teseo aluminium pipework constructed from rigid aluminium extrusion. Both Teseo’s hollow bar system (HBS) and Teseo Aluminium Pipework (AP) are diverse modular pipework systems. This makes them suitable for use in small workshops right through to large industrial facilities. They offer high efficiency and minimal pressure drop thanks to its smooth, seamless internal bore. 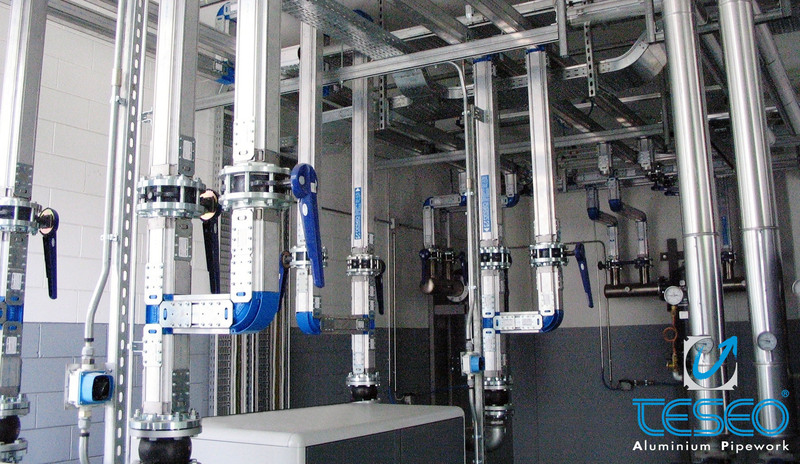 Teseo pipework system utilises a unique, dual ‘o’ ring sealing system. This compressed air pipework system helps in eliminating air leaks. Teseo pipework systems are available in sizes ranging from 25mm to 110mm i.d. – rated up to 15 Bar. A unique feature of the Teseo product is its true modular design. Multiple connections be made within close proximity of each other. Teseo’s ‘Hot Tapping’ also allows additional connections to be made whilst the system is under pressure. Flexibility - Allows for quick installation and modifications to the system. Even if the job is completed. Easy to make changes and add new branch lines or point of use drop. Air Quality - Made of natural aluminium without painting or electrochemical surface treatments. This makes the product resistant to corrosion and provides contaminant-free air. Low Maintenance - Reduces costs for leakages, downtime and labour for modifications. AP is available from sizes 20, 25, 40, 50 and 63mm i.d. - rated up to 15 bar. High Performance - Smooth internal bore allows higher flow rates and lower pressure drop. Easy Installation - Lighter and easier to manage compared to traditional steel systems. Push to fit - does not require welding threading or painting. Modify under Pressure - ‘Hot Tap’ live to create new points of use-eliminating production down time to your business. Zero Leaks - Unique Dual “O” ring sealing system eliminates air leaks. Energy efficiencies and cost savings compared to traditional galvanised systems are made from day one. Available from sizes 25, 32, 50, 63, 80mm and 110mm i.d. - rated up to 15bar. All Teseo aluminium pipework products come with a 20 year warranty. This protects against any damages resulting from material defect, the longest in its sector. For more information, either download the brochure or talk to one of our team.